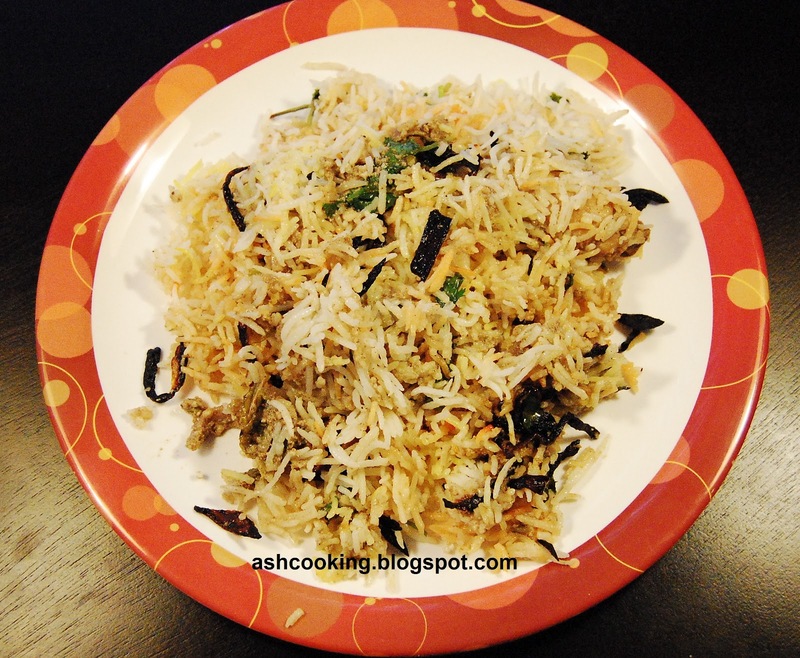 My hubby itching for biriyani seems to have become a regular affair on Sundays. Though most of the Sundays I satiate his desire cooking something else equally grand in taste in lieu of biriyani, but his biriyani craving perpetuates till finally I give in to his demand or he visits a restaurant to eat a plateful of the same. Well, the scenario is not as bad as I have mentioned above, but yes he is one of those crazy biriyani lovers. 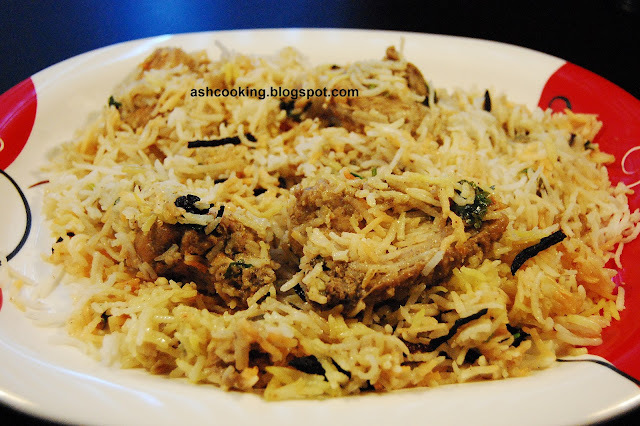 In our initial months in Bangalore, we used to try every biriyani food chain available nearby to seek out the best eatery conjuring up the biriyani most exotic in taste. We came across an array of very fine restaurants where the biriyani was one of the best items cooked; such as, Arsalan, ITC Fortune Welcome Group and Hyderabadi House. If despite staying in Bangalore, you didn't eat out in any of the above three mentioned, you are missing out on something. Ingredients: Cooking time: 1 hr 20 minutes approx. 1) Boil the almonds in microwave for 4-5 minutes. Drain the water and pressing the almonds between your thumbs, peel the skins off. Grind the almonds into a fine paste then. 2) Dry roast the ingredients for special garam masala and grind them into fine powder. 3) Cook the rice in required amount of water till it is 70% cooked. Don't forget to toss in the whole spices as mentioned while cooking the rice. 5) Heat oil in a pan and brown the julienned onions. When they are burnt and browned, take them on paper napkins to soak the excess oil. 6) Now heat oil in a wok. When the oil begins to smoke, add the ingredients for sauté and let them sizzle. Add the chopped onions and caramelize. Next add ginger-garlic paste, stir around and further add the almond paste. Sauté. Add few tbsp of water if the mixture turns dry. 7) Add cumin powder, coriander powder and the special garam masala powder. Mix well and sauté till oil floats on the surface. 8) Slide in the chicken pieces and stir in to mix. When the chicken loses its pink hue, add yogurt, green chillies, salt and mint leaves. Cook covered till chicken is tender. Fold in few tbsp of ghee. 9) Grease a baking dish with oil or ghee. 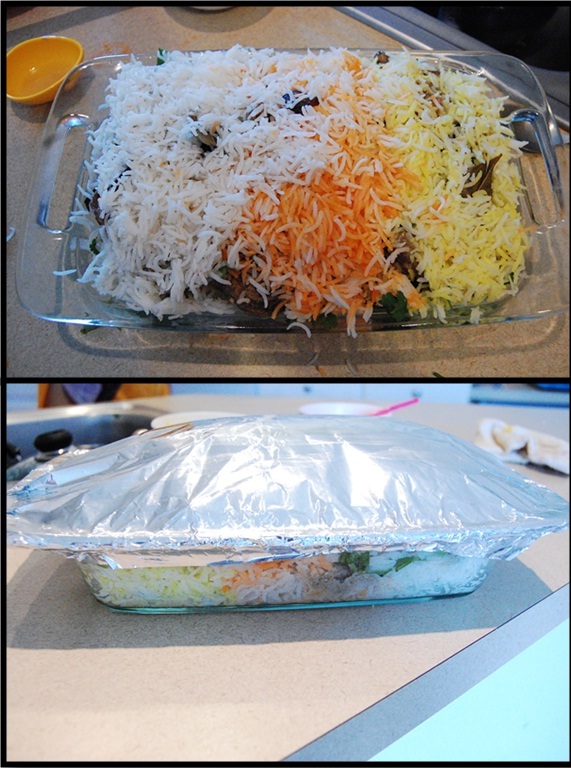 Here comes the most crucial step of all - organizing the rice and meat in layers to give birth to the exotic biriyani. Along the baking dish arrange the three colored rice side by side. Place few pieces of chicken on top, add the gravy, browned julienned onions, coriander leaves and few drops of lemon juice. Repeat the step once more with rice finally heaped on top. 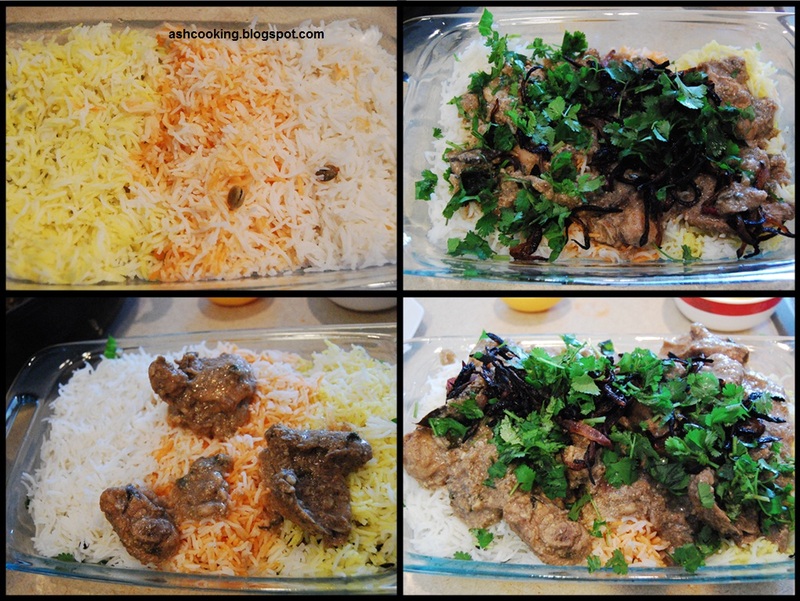 Don't forget to sprinkle coriander leaves and squeeze lemon juice on the final layer of rice before covering the dish. 10. Seal the baking dish tightly with an aluminum foil. Just take care that no leak or passage remains open to let the steam out during cooking. 11. Preheat an oven at 350 F / 180 C / Gas mark 3. Place the dish in oven and cook for 20-25 minutes. 12. Before serving, toss the biriyani with a ladle so that all the ingredients distribute uniformly. Serve hot and know the bliss!